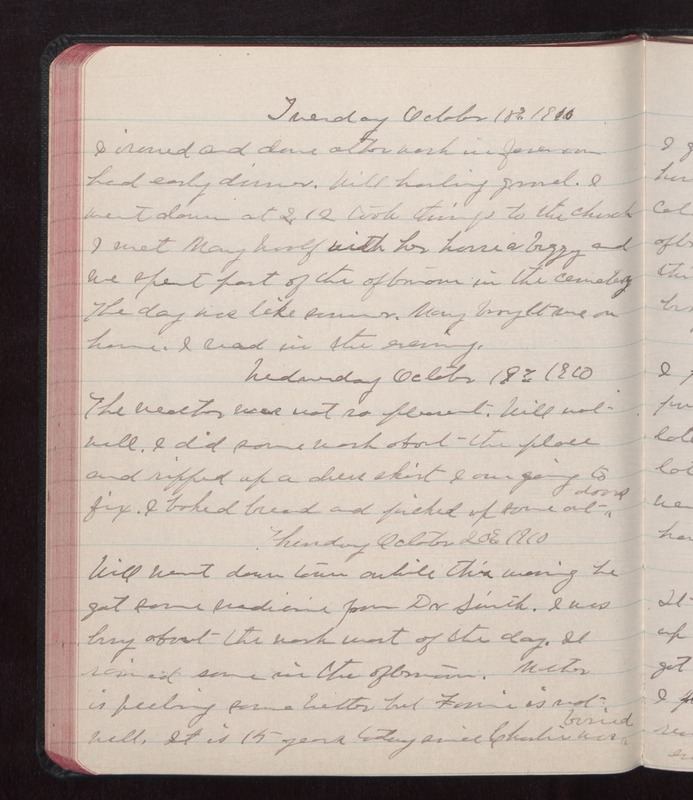 Tuesday October 18 1910 I ironed and done other work in forenoon. had early dinner. Will hauling gravel. I went down at 2.12 took things to the church I met Mary Woolf with her horse & buggy and we spent part of the afternoon in the cemetery The day was like summer. Mary brought me on home. I read in the evening. Wednesday October 19 1910 The weather was not so pleasant. Will not well. I did some work about the place and ripped up a dress shirt I am going to fix. I baked bread and picked up some out doors. Thursday October 20 1910 Will went down town awhile this morning he got some medicine from Dr Smith. I was busy about the work most of the day. It rained some in the afternoon. Mother is feeling some better but Fannie is not well. It is 15 years today since Charlie was buried.